(CHARLOTTESVILLE, Va.) – As President Obama prepares for his second inaugural, the University of Virginia Center for Politics has released the first comprehensive analysis of the 2012 election. Barack Obama and the New America: The 2012 Election and the Changing Face of Politics, published by Rowman and Littlefield, brings together some of the nation's top academics, analysts and journalists to examine how Obama won a second term and what his victory might mean for the nation's political future. "This is a book Democrats will love reading – but it's a book Republicans need to read," said Larry J. Sabato, director of the Center for Politics and editor of the book. "If Republicans don't understand the immediate past election, they are doomed to repeat it." 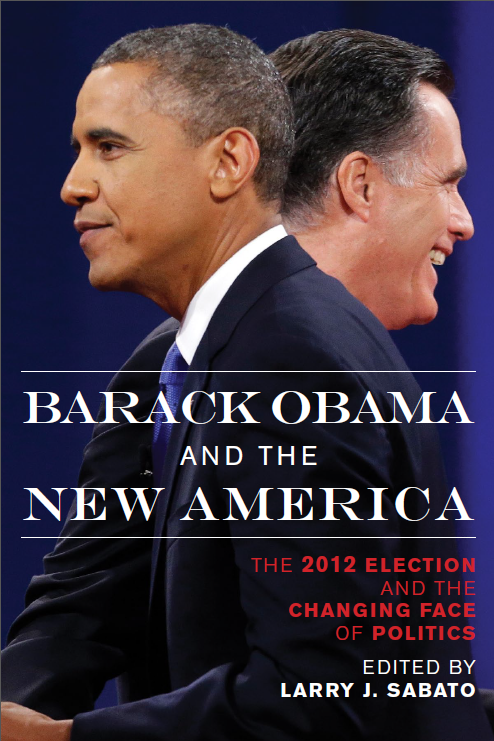 Featuring more than a dozen essays describing America's changing demographics, money and media in politics and the future of both political parties, among other topics, Barack Obama and the New America offers readers a comprehensive, in-depth examination of the forces that drove 2012. -Prof. Susan MacManus of the University of South Florida, on both sides' campaign strategies and tactics and what they tell us about future elections. As part of the inauguration festivities, Prof. Sabato is scheduled to be part of several broadcasts on Monday, Jan. 21 to analyze the prospects for Obama's second term and to discuss the newly released book. He will be appearing on ABC News and Yahoo! News' live-streaming coverage of the inauguration at 9:45 a.m., followed by BBC television's special coverage from 11 a.m. to 12:30 p.m. (with the network's Katty Kay) and then concluding with an appearance on "Your World with Neil Cavuto" on Fox News at 4 p.m.
For more information on Barack Obama and the New America, visit the book's Amazon page or Rowman and Littlefield's website. A high-quality image of the book's cover is available for download here. While the results of the Nov. 6 election are now history, scholarly discussions of their implications are just beginning. To that end, the University of Virginia's Center for Politics hosted its 14th annual American Democracy Conference Wednesday in the Newcomb Hall Ballroom. The daylong event featured three panels discussing the 2012 election results and their ramifications, the future of the political parties, and matters of public policy. The first panel focused on the election results. For Democratic Party pollster Mark Mellman, the fundamentals ruled the day in the presidential race. Many political science models indicated that 2012 would be a close election, but that President Obama remained a slight favorite – and that outcome is exactly what happened. But beyond the fundamentals, much attention was paid to the importance of the diverse electorate and the "Obama coalition" that played a key role in the president's re-election. Conservative commentator Fred Barnes said that he, like many Republicans, was amazed that the electorate proved to be so diverse once again. The panelists reviewed many pollsters' underestimation of minority turnout in 2012, leading into a discussion of the Republican Party's failure with Hispanic voters; 71 percent of Latinos voted for Obama, according to exit polls. Democratic strategist Maria Cardona predicted that simply changing the Republican Party's collective position on immigration would not be enough to end its struggles with Hispanic voters. The importance of the increasingly diverse electorate and how the GOP should respond to the new status quo was a theme throughout the day. The day's second panel offered interpretations of what the changing demographics of the country mean for the future. Discussion turned to whether Republicans must significantly alter their positions to appeal to non-white groups, particularly Latinos. "You've got to change the [Republican] brand," former Romney adviser Jim Perry said. But for him, "immigration reform nationally is not a cure-all." He emphasized that the GOP needs to do more at the state level to appeal to Hispanics. How different state parties handle upcoming bills similar to Arizona's immigration law will be an important factor in that effort. Talk moved to what diversity means for the future of the parties. RealClearPolitics' Sean Trende asked the all-important question: "What we saw this year, is it the Obama coalition or the new Democratic coalition?" Given poor Democratic performance in state and federal elections in 2009, 2010 and 2011, Trende was dubious that Obama's coalition would hold firm for another Democratic candidate in 2016. Democratic political analyst Jamal Simmons agreed somewhat, arguing that there is no Democratic nirvana purely from demographics; candidates must forge individual relationships with voters. Politico's Jonathan Martin predicted that Hillary Clinton would be tough to beat in 2016 because she could be capable of preserving the present Democratic coalition, while other prospective Democrat candidates might struggle. George P. Bush, the nephew of former President George W. Bush and the son of former Florida Gov. Jeb Bush, gave the conference's midday keynote address. Bush, a future politico to watch due to his name and the fact that he is half-Latino, also focused on the importance of Hispanic voters and how the GOP can better appeal to them. He first laid out the circumstances surrounding the increasing role of Hispanics in American politics and how their marked population growth will only continue. A major problem for Republicans, he said, was Hispanic outreach, particularly in Latino media. "President Obama outspent Romney by a factor of two-to-one. … From day one, there was more of a concentrated effort on [Obama's] side," Bush said. He suggested the GOP could connect with Hispanics by appealing to their strong entrepreneurial spirit and religious faith. The afternoon's final panel discussion turned to questions of policy, especially the fiscal cliff. Robert Costa, a reporter at the conservative National Review, highlighted Obama's poor record of communicating with GOP officials on the Hill. He criticized Obama for heading out on a "fiscal cliff tour," stressing that it was indicative of the president's inability to hash things out with House Republicans. Democratic strategists Kiki McLean and Joe Trippi disagreed and emphasized that the political world has changed. By appealing directly to the people through social media and other tools, Obama is "letting the people be his chief of staff," Trippi said. Despite their disagreements, the panelists agreed that some deal would be made to avert the fiscal cliff. Like every earlier panel, discussion again shifted to immigration reform. Panelists of all political stripes agreed that some sort of immigration reform would happen during Obama's second term because the GOP has recognized that it must move away from its previous hard-line position; the question, they said, is whether reform will take a macro or a piecemeal approach. (CHARLOTTESVILLE, Va.) – On Nov. 28, the University of Virginia Center for Politics will host the 14th annual American Democracy Conference. The event will bring together leading journalists and political experts to examine the outcome of the 2012 election and what it means for the country, the parties, and public policy. The event will begin at 9 a.m. and take place in the Newcomb Hall Ballroom on the Grounds of the University of Virginia. Confirmed speakers and panelists include Perry Bacon, Fred Barnes, Jamelle Bouie, George Prescott Bush, Carl Cannon, Maria Cardona, Kellyanne Conway, Robert Costa, Jonathan Martin, Kiki McLean, Mark Mellman, Jim Perry, Ed Rollins, Jamal Simmons, Sean Trende and Joe Trippi. The conference will feature three panel discussions, each with audience question and answer sessions. The first panel will review the 2012 election results, focusing on what happened and why. The second will examine the political future of the country, particularly the prospects of the two major parties. The final panel will discuss the politics of policy as the fiscal cliff looms. The event is free and open to the public with advance registration, and the press is invited to attend. For more information or to register, please visit http://hoosonline.virginia.edu/democracyconference. (CHARLOTTESVILLE, Va.) — The University of Virginia Center for Politics is hosting students from Bolivia and Peru for a week-long program focused on youth leadership training and civic engagement. During their stay, the program's 24 students and four teachers will participate in a number of educational events and programs in the surrounding area. The students arrived in Charlottesville on Saturday. Seminar with Professor Larry J. Sabato on American politics, Tuesday, Nov. 13, 10:30 a.m. to 11:30 a.m., Jefferson Hall at the University of Virginia. Visit to Monticello High School to meet with student leaders and compare school experiences, Thursday, Nov. 15, noon to 2:30 p.m. The student visit is part of the Center's Global Perspectives on Democracy (GPD) outreach effort and was organized in cooperation with World Learning and the U.S. Department of State's Bureau of Educational and Cultural Affairs. This is the second high school group the Center has hosted as a part of its GPD program; it is part of a two-year project that runs through next year featuring two delegations from Argentina and Chile and another two from Bolivia and Peru. (CHARLOTTESVILLE, Va.) – The University of Virginia Center for Politics, in partnership with the McIntire School of Commerce, will host a presentation by Mitch Feierstein about his book Planet Ponzi. The event will take place from 4 p.m. to 5:30 p.m. on Oct. 25 in Rouss/Robertson Hall, Room 120. Examining the global financial crisis, Planet Ponzi discusses how politicians have stood by and watched the financial industry create a massive overhang of debt, a mountain of low quality assets and ultimately, an economic disaster which has dwarfed all others. The United States and the world face a series of broad problems: vastly excessive debt, regulatory failure, a culture of deceit on Wall Street and governments that have promised their citizens far more than they can deliver. Mitch Feierstein is a highly successful hedge fund manager and CEO of the Glacier Environmental Fund Limited. Prior to this, he was Senior Portfolio Manager of the Cheyne Carbon Fund, part of one of the largest and most respected hedge fund groups operating in Europe. He divides his time between London and New York. The presentation is free and open to the public with advance registration, and the media is also invited to attend. To register, visit http://hoosonline.virginia.edu/planetponzi. (CHARLOTTESVILLE, Va.) – The University of Virginia Center for Politics and the Community Idea Stations have partnered to produce Out of Order, a 30-minute documentary exploring political gridlock and the decline in civil discourse in the U.S. Congress. The documentary will premiere on Thursday, Oct. 25, at 8:30 p.m. on WCVE PBS Richmond and WHTJ PBS Charlottesville. Over the last generation, citizens have increasingly expressed discontent with national politics. Congressional approval ratings are dismally low as partisan gamesmanship seems to rule the day. Senior leaders have noted that the collegiality they shared in the past with peers of differing political ideologies has disappeared in this era of polarization. Is the art of debate and compromise lost on contemporary politics? Is it possible to restore civility to Congress, and should we try? And is Washington actually less civil than it was in previous generations? Out of Order relies on interviews with prominent academics, journalists, political observers and senior (current and former) elected officials. The production features first-hand accounts by respected statesmen and women. Among the interviewees are Sen. Mark Warner (D), CBS News' Bob Schieffer, former Sens. John Warner (R) and Alan Simpson (R) and Center for Politics Director Larry J. Sabato. (CHARLOTTESVILLE, Va.) – Fifty years after the world was brought to the brink of nuclear war, a panel will discuss the Cuban Missile Crisis, examining both the events that led to the dramatic episode as well as its aftermath and how it affected the Cold War. University of Virginia Center for Politics Senior Historian Andrew M. Bell will moderate the panel of experts at the University of Virginia's Wilson Hall, Room 402, on Thursday, Oct. 18, from 7:30 p.m. to 9 p.m. The panel is free and open to the public with advance registration. To register, visit www.centerforpolitics.org/cubanmissilecrisis.html. Members of the media are also welcome to attend. The panel is presented as part of the Center for Politics' Anniversary Series, which commemorates landmark political events in American history through public lectures, programs, television documentaries and teaching resources offered to a nationwide audience. Center for Politics to celebrate Constitution Day with "James Monroe" & "John Marshall"
(CHARLOTTESVILLE, Va.) — Historical performers portraying former President James Monroe and former Chief Justice of the United States John Marshall will discuss the Constitution on the Grounds of the University of Virginia on Monday, Sept. 17. The program, which will run from 10 a.m. to 11:30 a.m., will be held at Old Cabell Hall. It is presented by the University of Virginia Center for Politics in recognition of Constitution Day, recognizing the anniversary of the day the U.S. Constitutional Convention signed the Constitution in 1787. Founding Fathers and Virginia natives, Monroe (portrayed by Dennis Bigelow) and Marshall, (portrayed by Mark Greenough) were leading figures during this formative period in American history. Monroe aligned himself with the Republican faction led by Thomas Jefferson and James Madison, while Marshall was a Federalist, associated with George Washington and John Adams. The two will discuss early American political arguments and take questions from students. Members of the media and the general public are welcome to attend. (CHARLOTTESVILLE, Va.) — The University of Virginia Center for Politics will hold the 14th annual Virginia Political History Project at the Virginia State Capitol building in Richmond on Friday, June 22. The day-long conference will examine Virginia's influence on presidential politics past and present. Beginning at 10:30 a.m., the conference will start with a series of presentations by historical performers on each of Virginia's eight presidents. From George Washington to Woodrow Wilson, the morning portion will showcase the Old Dominion's historical role as the "Mother of Presidents." The conference is free and open to the public with advance registration. Lunch will be provided, and the press is invited to attend. Last week, Twitter user @chrishale7 asked NBC News political director Chuck Todd about making an electoral map showing the states by their population size, rather than just a straight geographic map, in order to better show the importance of the states in the Electoral College. Todd (@chucktodd) replied by suggesting that this was something we might like to take on. Sure enough, we do love what we call the "political map of the United States." 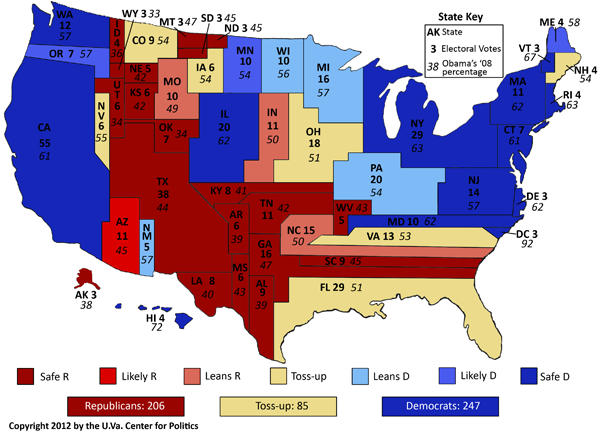 The University of Virginia Center for Politics (back then, it was the Center for Governmental Studies) released a political map of the United States after the 2000 election, which was created by former center staffer Josh Scott. We updated the map in 2004, and now we've tweaked it to reflect the 2010 census. The states are sized based on their populations. The political map goes to show how divided the nation really is. Aliens from another planet might look at, say, the 2000 electoral map, in which George W. Bush won 30 states, and say that he romped in the election. But, of course, Al Gore's 20 states — and edge in the popular vote — meant that the Electoral College map didn't tell the full story of how close the election was. 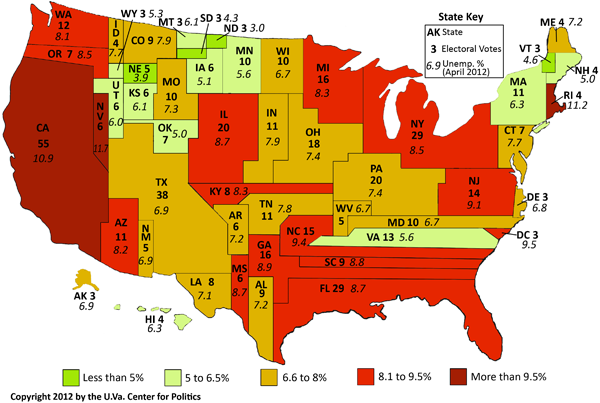 A political map, along the lines of what's below, gives a more accurate view of the electoral value of each state. Below are two political maps: One shows the current state of play in the Electoral College, and the other color-coats the states by their most recent unemployment rate. The political map is what politicians, their staffs and political consultants actually see when they look at the nation: swing states that stick out like big yellow thumbs surrounded by safely Red and Blue states both big and small. (CHARLOTTESVILLE, Va.) - A delegation of government officials and civil society leaders from Afghanistan are beginning a three-week session today focused on the foundational principles of democratic governance as well as citizen participation and civic engagement in a democratic society. This U.S.-Afghanistan Professional Partnership Program is part of the University of Virginia Center for Politics' international outreach program, Global Perspectives on Democracy, which was launched in 2009. The 22 delegates are female officials from Afghanistan's Ministry of Justice, Supreme Court and a variety of civil society organizations. Delegates will participate in lectures and presentations by prominent American legal scholars, jurists and political figures, including Judge J. Harvie Wilkinson, Virginia Supreme Court Justice William Mims and Virginia Attorney General Ken Cuccinelli. The group will also visit key sites related to the foundation of America's democracy at a time when Afghanistan is building its own democratic government. They will participate in lectures at Virginia landmarks including Monticello, Montpelier, Jamestown and Williamsburg and make visits to Richmond, Virginia Beach and Shenandoah National Park. While in Charlottesville, participants will receive hands-on experience through job shadowing at area nonprofit organizations. Class sessions will feature presentations by minority groups and dialogues on interfaith understanding. The program is designed and run by the Center for Politics, as part of its Global Perspectives on Democracy program, in partnership with Relief International and sponsored by the U.S. Department of State Bureau of Educational and Cultural Affairs. This is the third of four groups from Afghanistan that will participate in the program; two groups participated last summer, and one more will be arriving after this group departs. (CHARLOTTESVILLE, Va.) - On Tuesday night, Professor Larry Sabato peered deep into his renowned Crystal Ball to examine the landscape of the 2012 election. But Sabato, the Robert Kent Gooch Professor of Politics and director of the University's Center for Politics, made it clear that it's much too early to make any concrete predictions. "You can flip a coin," said Sabato, "and have as good a chance of knowing the outcome as we do right now." The packed auditorium in Wilson Hall listened as Sabato laid out the strengths and weaknesses of President Barack Obama and his presumptive Republican challenger, Mitt Romney. He also discussed the unknowns that could greatly influence the outcome of the presidential election, such as an economic surge or another recession, or, in the realm of foreign policy, a conflict with Iran. Examining the current state of the Electoral College, Sabato declared that there are "seven super swing states" that will decide the election. Among those key states is Virginia. Sabato told his audience to expect to be right in the middle of the presidential contest. "After Labor Day, you won't able to turn on the TV without seeing an attack ad," the political pundit predicted. Sabato and his Crystal Ball team also discussed the congressional races, saying that the Republicans would likely hold on to the House of Representatives while the Senate would be a closely fought battle, with a 50-50 outcome being a real possibility. One of the most competitive Senate contests will be in Virginia, where former Governor Tim Kaine (D) hopes to stop former Senator (and U.Va. alumnus) George Allen (R) from recapturing his old seat. The Crystal Ball team highlighted that the most important factor in the race would probably be the "coattails effect," meaning that the party that wins the Old Dominion in the presidential race will very likely claim the state's Senate seat as well. The program gave Sabato a chance to reiterate his motto that "Politics is a good thing." Sabato founded the Center for Politics in 1998 to promote the value of politics, improve civics education and increase civic participation through comprehensive research, pragmatic analysis and innovative educational programs. Tuesday night's presentation served as an opportunity to increase awareness about the specific issues and topics that will dominate the 2012 campaign season. (CHARLOTTESVILLE, Va.)—Students from Argentina and Chile will arrive at the University of Virginia Center for Politics on Saturday, March 24 to begin a week-long program focused on youth leadership training and civic engagement. During their stay, the program's 30 students and four teachers will participate in a number of educational events and programs in the surrounding area. Visit to Monticello; Monday, March 26, 2:15 p.m. to 5:30 p.m.
Seminar with Professor Larry J. Sabato on American politics, Tuesday, March 27, 11:30 a.m. to 12:30 p.m., Jefferson Hall at the University of Virginia. Visit to Monticello High School to meet with student leaders and compare school experiences, Wednesday, March 28, noon to 2:30 p.m. Speech by Arun Chaudhary, former White House Videographer, Wednesday, March 28, 6 p.m. to 7:30 p.m. Rotunda Dome Room at the University of Virginia. The student visit is part of the Center's Global Perspectives on Democracy (GPD) outreach effort and was organized in cooperation with World Learning and the U.S. Department of State's Bureau of Educational and Cultural Affairs. This is the first high school group the Center has hosted as a part of its GPD program; it is the opening exchange of a two-year project that will bring two delegations from Argentina and Chile and another two from Bolivia and Peru to conclude in fall 2013. Following their stay in Charlottesville from March 24 through March 30, the students will depart for two-week home stays in Portland, Dallas and Kansas City. (CHARLOTTESVILLE, Va.) — The University of Virginia Center for Politics' Youth Leadership Initiative (YLI) held its first-ever Super Student Day Mock Election leading up to the 2012 Super Tuesday primaries. Students from across the nation participated, contributing their opinions and voices before registered voters went to the polls on Super Tuesday. Mock election polls opened on Thursday, March 1 and remained open though 7 p.m. Eastern time on March 5. The YLI Super Student Day Mock Election ballot included the Republican candidate for president, a race between the eventual Republican candidate and President Obama, a political ideology survey, a political party survey and an issues referendum. As in past years, teachers had the ability to customize ballots to meet the unique needs of their students. The mock election is an excellent example of an activity that encourages lifelong civic engagement. "I get to have my first say in the world, and it all started in the classroom," said YLI student Dorothy Joyner on beginning her voting career with YLI's Super Student Day Mock Election. Her teacher, Hal Hankins of Albemarle High School, is one of the 50,000 registered YLI teachers with the ability to participate in the simulation. Students from 37 states participated in the YLI Super Student Day Mock Election. The youth voters' top Republican presidential pick was Mitt Romney, who took 28.7% of the vote. As for the general election, 42.5% of students said that they would vote for the Republican candidate while 40.4% said they would support President Obama. The YLI Super Student Day Mock Election is not an accurate predictor of the general election outcome, nor is it a scientific poll, and it should be evaluated only as an educational tool for students. More than 9,200 students participated in this prototype mock primary election. YLI will hold its National Mock Election in October during the lead-up to the 2012 national elections. (CHARLOTTESVILLE, Va.) — As the Republican presidential race heads to a slate of potentially decisive contests on Super Tuesday the first week of March, the University of Virginia Center for Politics has gathered a group of top political experts to make sense of the political season ahead. Center for Politics Director Larry J. Sabato will moderate the panel. (CHARLOTTESVILLE, Va.) – After hosting two visiting delegations of Afghan women from high levels of government and civil society last summer, staffers from the University of Virginia Center for Politics traveled to Kabul where they reunited with the Afghan delegates of the U.S.-Afghanistan Professional Partnership Program exchange. While attending the Center's program in Charlottesville, the delegates learned about the foundational principles of American democracy and civic engagement in a democratic society and participated in job shadowing opportunities throughout the city. The return portion of the exchange was organized by Relief International and sponsored by the U.S. Department of State Bureau of Educational and Cultural Affairs. While in Kabul, Irby and Heubeck met with government officials involved in women's affairs, the justice system and nonprofit organizations that focus on women and children's issues and civic engagement. "While Afghanistan obviously has major hurdles to clear, there is a passion among many in the country for establishing a greater level of freedom and stability. In the U.S., the tragedies are what make the news, but significant progress is being made," Irby said. "What will be integral to Afghanistan's future will be to develop a culture of civic engagement where citizens plan an active role in day-to-day decision making both in their communities and in the nation as a whole. They are taking the first steps to make that happen," Heubeck said. Read an opinion piece published about this mission in the Richmond Times-Dispatch. The Center for Politics will host two additional Afghan delegations this spring. YLI to host Super Student Day Mock Election! The Youth Leadership Initiative (YLI) is proud to announce that it is holding the first National Super Student Day Mock Election from March 1st through March 5th, 2012. All registered YLI teachers will be able to engage their students by allowing them to weigh in on the GOP Presidential primary. The event is planned to coordinate with Super Tuesday on March 6th in which ten states will hold primaries to determine the Republican candidate for president in 2012. Educators already registered with YLI need only to login at www.youthleadership.net and click the Mock Election link from the Welcome page. The Getting Started tab will have all of the resources necessary to make voting in the National Super Student Day Mock Election a success. YLI hopes this first National Super Student Day Mock Election will increase student interest in the election and engage students in American democracy. Have questions? Call toll-free 1.866.514.8389 or email ylihelp@virginia.edu for more information. Get in the game with YLI's National Super Student Day Mock Election! 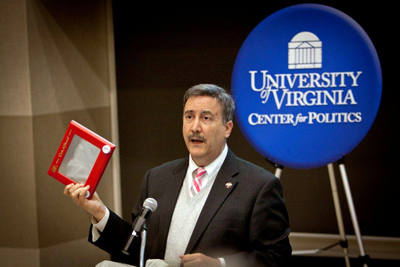 (CHARLOTTESVILLE, Va.) – University of Virginia Center for Politics Director Larry Sabato has pledged to personally match gifts to the Center in an effort to raise $500,000 between now and December 31, 2011. Sabato, the Robert Kent Gooch and University Professor of Politics, will match 100% of every contribution to the Center until the end of the year to reach the fundraising goal, for a maximum donation of $250,000. The Center encourages donations of any amount, and reminds those whose companies provide charitable contribution matches that those gifts will have three times the power to improve the civic life of our nation. Money raised will support the Center's many programs and initiatives, including the Youth Leadership Initiative, which provides civics education to students in all 50 states, and Global Perspectives on Democracy, which fosters citizen-to-citizen dialogue among the United States and other democratic societies around the world. (CHARLOTTESVILLE, Va.) – As a part of its Global Perspective on Democracy program, the University of Virginia Center for Politics will host former Sri Lankan President Chandrika Badaranaike Kumaratunga on Monday, Nov. 14, from 6 p.m. to 7:30 p.m. in the Rotunda Dome Room. 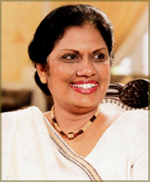 As Sri Lanka's president from 1994 to 2005, Kumaratunga led the island nation through a trying period of civil war. The 26-year-long conflict between the government and Tamil Tiger rebels only concluded in 2009, marking the beginning of a new era for the nation. As the country moves forward, questions remain about pluralism, civic engagement and reconciliation in the aftermath of the civil war. Registration for the event is now full, but members of the media interested in covering the event are welcome to attend. The Center for Politics' Global Perspectives on Democracy (GPD) program is aimed promoting the exchange of democratic ideas and improvement of civic engagement, citizen participation and civil discourse around the world. The visit by President Kumaratunga follows a series of official exchanges between the Center for Politics and Sri Lanka. In 2009, the Center hosted a visiting delegation of 18 young professionals from Sri Lanka who participated in a three-week internship program organized in partnership with Relief International and funded by the U.S. Department of State. As a reciprocal part of that program, Center representatives then traveled to Sri Lanka to conduct workshops on civic engagement, federalism, and new media applications. In June 2010 a second delegation from Sri Lanka spent four weeks learning about new media journalism, freedom of the press, pluralism, and civic engagement.